What is Hillary Clinton hoping you’ll forget? Her vote to authorize the Iraq war. AMAs the 2016 Republican presidential aspirants assess the best way to confront Hillary Clinton as the Democratic front runner, a Republican-turned-Democrat, Lincoln Chafee of Rhode Island, thinks he’s found her weak spot, and may take her on for the Democratic presidential nomination..April 13 — Daniel Neidich, chief executive officer at Dune Real Estate Partners, and Sarbjit Nahal, head of thematic investing at Bank of America Merrill Lynch, discuss Hillary Clinton¿s presidential campaign and how she can connect with voters. Mr. Chafee, a former senator and governor, says he’s considering challenging her on grounds of her support of President George W. Bush’s 2002 resolution authorizing use of force to invade Iraq. Mr. Chafee, as a Republican senator at the time, was the only one to vote against the measure, and thus is particularly qualified to raise the issue against her. 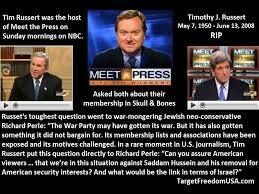 Mr. Chafee offered the reminder that “there were no weapons of mass destruction” found, the basis for the 2003 Bush-led invasion as a pre-emption of an assumed threat to American national security. He thus joins former Democratic Sen. James Webb of Virginia, among others, in contemplating a challenge to the former first lady, secretary of state and senator for the 2016 presidential nomination. If both Messrs. Chafee and Webb formally enter the race, not only Hillary Clinton but any other Democrats competing, such as former Maryland Gov. Martin O’Malley, also will be hard-pressed to state their views on an issue that Ms. Clinton obviously hopes will not be unduly resurrected. At the time of the vote on the 2002 use of military force resolution, still used as a basis for U.S. armed interventions in the Middle East, Ms. Clinton called it “probably the hardest decision I’ve ever had to make.” She said she supported it because of White House assurances it would make “war less likely,” by persuading the United Nations to approve further weapons inspections in Iraq. In fact, what happened was that the international inspectors did go back into Iraq but the Bush administration ultimately called for their evacuation, as a prelude to the “shock and awe” invasion launched in March of 2003. In a debate among the 2008 Democratic candidates in Los Angeles, Ms. Clinton observed that “it’s clear that if I had been president we would have never diverted our attention from Afghanistan,” where the fight against the Taliban was still going on. As Hillary Clinton begins her long-awaited candidacy for the 2016 Democratic nomination, her vote for the invasion of Iraq could well overshadow the nagging Republican accusation of complicity or neglect in the Benghazi, Libya, attacks on her watch as secretary of state. So challenges from longshot competitors, such as those of Jim Webb and Lincoln Chafee, could pose unwanted pivoting back to the whole Bush fiasco in Iraq, which would be a political headache not only for Hillary Clinton, but also for the Republicans generally, and especially for Jeb Bush, brother of the man who started it all. …can be seen in this year’s Rhode Island Senate race. As I’ve been arguing ever since I published the first mainstream media investigation of the Yale Secret society back in 1977 (“The Last Secrets of Skull and Bones” in Esquire, reprinted in my collection %%AMAZON=0060934468 The Secret Parts of Fortune%%), the true significance of Skull and Bones, lies not in its mondo-bizarro macabre initiation rituals (which a team of videotapers I assembled was the first to expose–and get broadcast on national tv–back in 2001) but as an instance of how power actually operates in America. Not through occult back room conspiracies, but through the kind of easily exposable networking that most resembles the Old Boy network of influence and power in the U.K., and which has sustained the reign of the East Coast blue-blood elite in private and public power for longer than it wants you to know. And so just as we had two Bonesmen run for President in 2004, we now have two sons of Bonesmen running for the Senate seat in Rhode Island this year. The son of Charles Sheldon Whitehouse, Skull and Bones ’44, Sheldon Whitehouse, is running against Lincoln Chafee, the son of John Chafee Skull and Bones ’47. And guess who came up to campaign for Lincoln Chafee during his primary fight, according to Katha Pollit in The Nation? 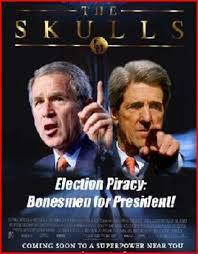 None other than George W. Bush, Skull and Bones, ’68, even though politically he was closer to Chafee’s right wing opponent. 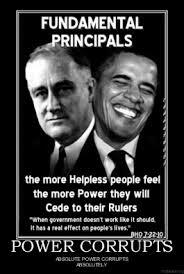 That’s the way “secret” power works in America. Out in the open, in your face if you know where to look for it. This entry was posted in Weapons of Mass Deception, International Law and Nuremberg Precedents, REAL HISTORY UNCOVERED, WHISTLE-BLOWERS, IMPERIAL HUBRIS AND HYPOCRISY, SKULL AND BONES, US AND HUMAN RIGHTS, SOCIAL STRUCTURES OF ACCUMULATION, TERRORISM, FALSE FLAG OPS, Secret Societies, MSM MANIPULATION, NATIONAL SECURITY STATE, VIETNAM AND IRAQ WARS, VETERANS AND RESISTANCE, POLITICAL ECONOMY OF IMPERIALISM, Neoclassical and Neo-liberal Economics, CONSERVATIVE CHRISTIANS AGAINST IMPERIALISM, rise and fall of empires, nuremberg precedents, IMPERIAL SOCIAL SYSTEMS ENGINEERING, EPISTEMOLOGY AND SCIENTIFIC METHOD, HOW TO LIE WITH STATISTICS, corrupt elites, despotic academia, ideological classrooms, Contradictions of U.S. Imperium, Full SPECTRA Dominance, Revisionist History, Imperial Impotence, Panopticon Effect, non-Official Government Leaking for PR, Nobel Prize for Chutzpah, petit-bourgeois freedoms, Comparative Systems and Constitutions, Cultures of Narcissism, Chickenhawk Nation, Proto-Fascism. Bookmark the permalink.